APPRENTICE jockey Jed Hodge collected a win aboard Animal Instinct at Ipswich's Friday meeting to give Beaudesert a win among regional winners from across South East Queensland. Animal Instinct won his maiden for trainer Greg Cornish at his fourth career start as other winners on the day came from Toowoomba to the Gold Coast. There were two Brisbane winners as well as Les Ross produced Red Colour to win with Brad Stewart aboard and My Delilah won for trainer Barry Lockwood and jockey Jim Orman. The Gold Coast winners were Lyrical Prince, for Gary Doughty and Matt McGillivray, and Jets Cracker for former Ballina trainer Stephen Lee and jockey Jim Orman. This gave Orman a winning double for the day to continue his strong form in the new season. After fracturing a vertebrae back in January in a Sunshine Coast fall, Orman has returned to the saddle. He's had a sparkling start to the new season. 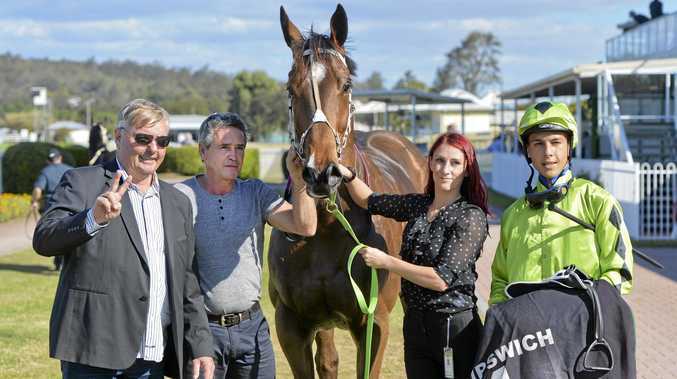 Friday's success made it three wins at Ipswich. That was with a couple of wins at the Sunshine Coast, including a victory on Sunday, and victories at Doomben over the past couple of weeks. Toowoomba winners on Friday were in the first and last races with Errol for Paul Nolan jnr and rider Ronnie Stewart, and Noble Billy for Rochelle Smith and jockey Ryan Plumb. PAUL Nolan jnr was quick to cast back memories of a more famous win by the family over the same course in 1998, after collecting a maiden win for Errol over the 2150 distance on Friday. Nolan snr trained a galloper called Paul's Folley who won the 1998 Ipswich Cup for an owner who originally thought the trainer had made an error in buying the galloper - hence the name Paul's Folley. With Aaron Kennedy in the saddle, Paul's Folley managed to collect his biggest scalp in winning the Ipswich Cup 20 years ago. Errol reminded Paul Nolan jnr of that day just over 20 years ago. Errol was the bottom weight for the race after just one third placing from 16 career starts. Despite those stats, Errol was kept relatively under notice in the betting for the race as fourth favourite at $8. The 2150 metres of the race was the distance the six-year-old gelding needed as he sustained a wide run from last at the 1000 metre mark. Errol hit the front at the top of the straight and despite the torrid run actually drew away on the line to win clearly by three lengths going away. Errol proved to be the strongest stayer in the field and Nolan will probably as a result aim solely at distance races for the galloper going forward. SATURDAY'S race meeting will not only double with a Handmade Expo Market, but will also include a first time use of the refurbished viewing terrace. This area will become the predominant public race viewing area in the near future as the old beer garden bar has now closed. The old bar has closed in preparation for the imminent construction commencement of the new jockeys and steward's rooms, along with new bar and kitchen, and the new member's lounge and events centre atop. There will also be a new forecourt inside the main entry gate as well as a carpark in place of some of the old stalls - all planned to be built over the next 12 months as advised by the project managers Racing Queensland. The Ipswich public are welcome to visit the racetrack this week to seek a bargain at the markets and to take advantage of the refurbished viewing terrace up on the hill with a commanding view over the course. Bookmakers and tote facilities have moved to this area while it is planned that the kitchen will relocate there in a few weeks. RACING this week at Ipswich is on Saturday, which doubles as a Handmade Market Day. The final two August meetings are Friday, August 24 and Wednesday, August 29.